Blondie and Brownie: Ample Hills Makes Awesome Soft Serve, Too! The soft serve is super rich and creamy and according to Time's report it's "authentic bread flavor comes from steeping toast slices in hot milk. The mushy bits are strained out before the butter and cinnamon are added." I don't know if "funky" really does the flavor justice. If you love French Toasty goodness, this should win your favor. It really does have nice bready overtones and it's heavy on the cinnamon. The companion flavor is a Bourbon, Straight Up which is made with Maker's Mark and vanilla bean. It's boozy and though I only got a small sample on the side, I can imagine it would be great swirled with the Cinnamon Toast. 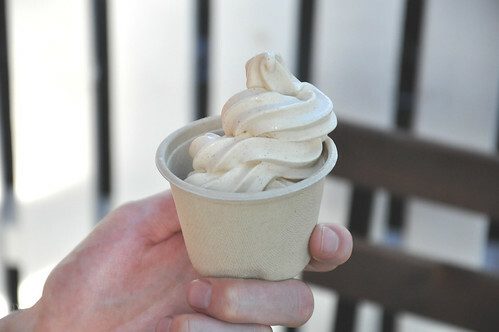 The soft serve flavors will rotate, so be sure to keep tabs on them via Facebook. I went to Ample Hills this weekend for the first time and it was amazing! I was definitely disappointed that the cinnamon soft serve was sold out--it did sound fun and funky.